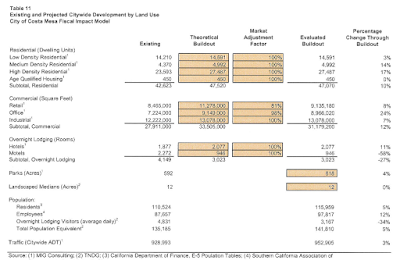 Why The "Revised" Agenda For The Planning Commission Meeting? 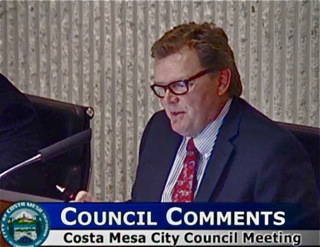 In my previous entry we addressed the meeting Monday evening of the Costa Mesa Planning Commission and I made a slight reference to the big item on it - the General Plan update and the Draft EIR - as being the "remaining" items on the agenda. IT WAS ON FACEBOOK, SO IT MUST BE TRUE! Well, what I meant by that was the agenda had been published earlier and it included another item. However, for some inexplicable reason (tongue in cheek here), it has been rescheduled. That item involves two sober living facilities side-by side - that's against our ordinances - at 165 East Wilson. Read the brief summary of the item HERE. It's been rescheduled for the Planning Commission on April 25, 2016. 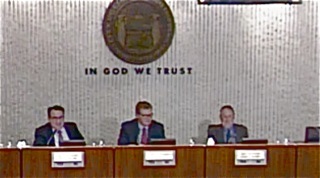 Planning Commission Chairman Rob Dickson posted a vague reference to this on Facebook - apparently the official city record of proceedings in our town these days. So, what caused this rescheduling? Did it have anything at all to do with the settlement of the lawsuit between the City and Solid Landings last week? I read the brief summary and wonder how the heck this thing is being considered in the first place? So, we'll wait two more weeks to see if the Planning Commission will approve the request to violate our ordinances... or not. 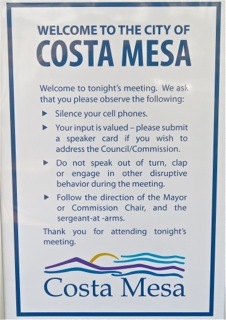 The Costa Mesa Planning Commission will meet again on Monday, April 11, 2016 beginning at 6:00 p.m. in City Council Chambers at City Hall. You can read the agenda report HERE. The Consent Calendar contains one item that might get some separate discussion - the review of the requirements of the Conditional Use Permit for the Halal Guys restaurant on Bristol Street, HERE. The staff recommendation is to receive and file the report. The only other item remaining on the agenda is the approval and forwarding on to the City Council of the 2015-2035 General Plan Update and Draft Environmental Impact Report, HERE. That 68-page report is actually pretty easy reading and outlines the road map for development in our city for the next nearly two decades. 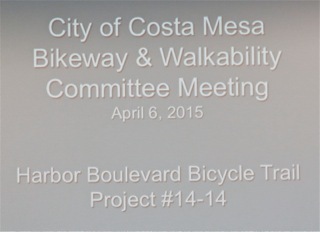 The Costa Mesa Bikeways and Walkability Committee met Wednesday evening at the Costa Mesa Senior Center before a very small crowd - four visitors joined the committee this time. Ten of the twelve members remaining on the committee attended. Leah Ersoylu and Tony Capitelli did not attend. 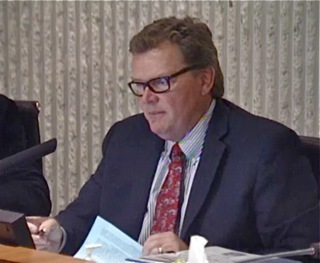 Nor did council liaison Katrina Foley and NMUSD liaison Dr. Kirk Bauermeister, both of whom are out of town, or Chamber of Commerce liaison Brent Stoll, who is dealing with family issues. 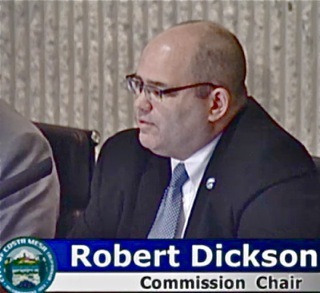 During Public Comments Parks and Recreation Commissioner Bob Graham stood to ask the committee to push forward to have the existing Bike Map modified to show potential routes. 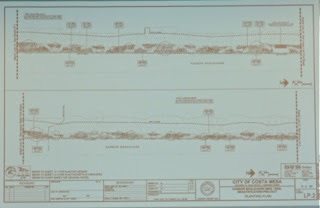 He also, once again, brought up this idea of opening up the pathway along the Greenville-Banning channel for bicycle and pedestrian use. When he brought this up to this committee the last time a couple months ago more than 30 neighbors along that channel attended and spoke out strongly against that plan, citing privacy and safety as the main reasons. Graham is persistent, though. 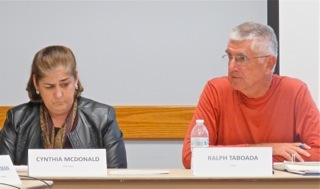 After he finished Chairman Ralph Taboada said he would ask the committee to discuss putting it on a future agenda at the end of the meeting. More on that later. 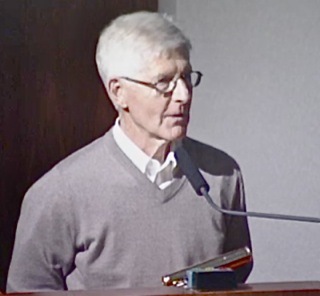 During Committee Member Comments, Rick Huffman stated appreciation for the Greenville-Banning Trail, but also recalled the vehement rejection of the idea by neighbors. 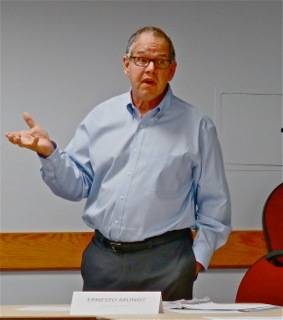 John Merrill spoke on the "Go Human" campaign. Jim Kerins complimented the staff. 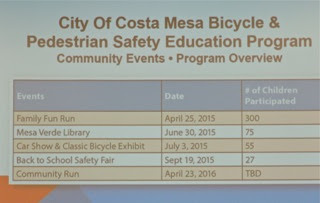 Jim Erickson mentioned the Costa Mesa Community Run, which is coming up and wondered how he could help represent the committee at that event. 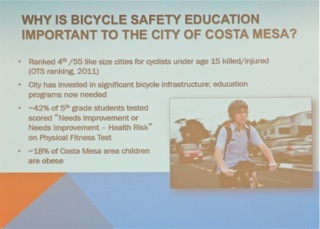 He then showed a brief video clip of a Bike Park in Irvine, which includes a resting place and permanently-installed tools. 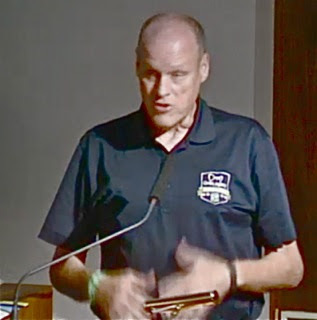 James Kane, referring to the Greenville-Banning Trail, referred to the "negativity from the NIMBYS" - the neighbors who spoke out at the earlier meeting. He suggested a large wall could be buile and motion-detector lights installed. 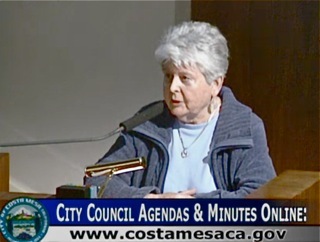 Flo Martin showed slides of a homeless person receiving a citiation from a Costa Mesa Police Officer - perhaps a Park Ranger - for not having her bicycle in a proper bike rack at Wilson Park. Martin suggested that the adjacent rack was full at the time, which launched a long discussion of bike racks in general. The city is sorely in need of bike racks in most, if not all, public areas. Ernesto Munoz suggested this is the time to lobby the city council on that issue since the budget is in the midst of being prepared. 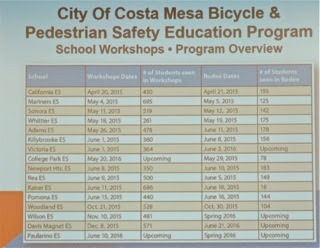 Cynthia McDonald told the group of a Cyclovia in Lynwood/South Gate on May 15th. 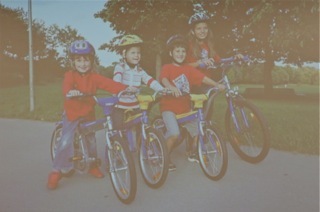 Taboada said he will be speaking to the council at the next meeting about bike racks. Andrea Marr mentioned the "Action Arts In The Park" sponsored by the Cultural Arts Committee, to be held in TeWinkle Park in the afternoon of May 14th. 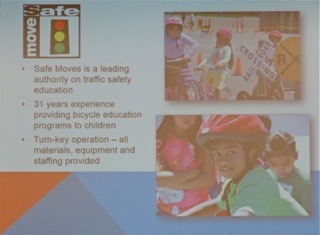 The first New Business item was a presentation by Pat Hines, founder of Safe Moves, a bicycle education program currently being used in Costa Mesa elementary schools and is funded by the city through a grant by the Orange County Transportation Authority. Hines formed this business more than three decades ago after her best friend was killed in a bicycling accident. Since then she and her team have worked with thousands of children all over the state. 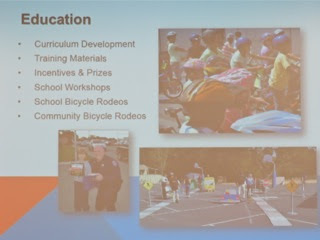 The following slides will capture the essence of the program. Next up was a briefing by Director of Public Services, Ernesto Munoz, on the status of the new Harbor Boulevard Bicycle Trail. The following slides will help you understand the scope of the project. 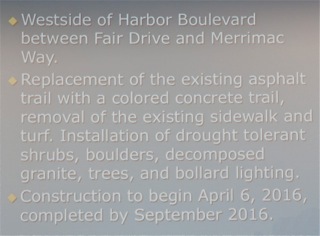 Basically, it's providing a 12 foot wide multi-purpose trail removed from the vehicular traffic by landscaped areas and will be lighted with bollard lighting for safety. 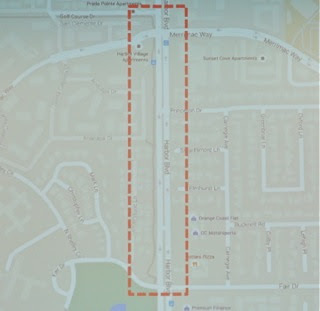 Transportation Services Manager Raja Sethruaman provided an update on Grant Projects and explained the status of the project for a signal on Placentia Avenue at the bottom of the hill from Adams Avenue at the northern border of Fairview Park. That will be installed soon. 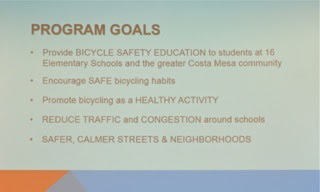 Additional funding is being sought for the 19th Street Bicycle Trail to accommodate the processing through the Coastal Commission. The construction funds are secure. 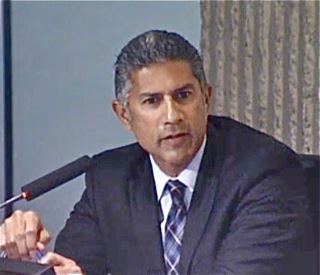 During the discussion of items for the next meeting agenda Taboada, as promised, opened up the Greenville-Banning path for discussion. After several minutes of discussion, the commissioners chose NOT to place it on the next agenda, citing the overwhelming negative outcry the last time a couple months ago. Graham was not happy with that turn of events and grumbled about the residents who showed up at that previous meeting, referring to them as a mob. Since Graham doesn't like to hear "no", I suspect he will find some other way to get this issue into the municipal discussion. The committee meets next on May 4th. Big News From The Council Meeting! I wondered what kind of a meeting was ahead for us last night when I found a brand new sign standing outside City Council chambers. Two identical signs were placed strategically inside the chambers where folks line up to speak, too. Kind of a mixed message, don't you think? "Welcome, but don't you dare show any emotion!" 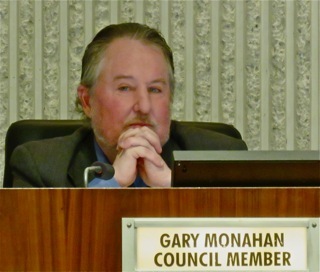 Right off the bat the Costa Mesa City Council meeting jolted us awake when the Deputy City Attorney Tarquin Preziosi reported out from the delayed Closed Session (they couldn't come up with a quorum until 5:15, when Gary Monahan finally showed up) that the two lawsuits between the City and Sober Living operator Solid Landings, had been settled! 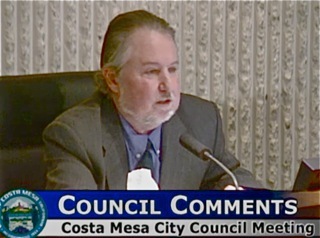 The short version of this story is that Solid Landings, under it's various names, has agreed to pull out of all Costa Mesa residential areas and to immediately move their counselling facilities from locations on West 19th Street and Placentia Avenue to commercial and industrial zones within the City on Bristol Street and Airway Avenue, near John Wayne Airport. According to the report, they will immediately close 15 residential facilities and shutter another 18 over the next two to three years due to lease obligations. Both sides will pay their own legal fees. Read Daily Pilot reporter Luke Money's story posted shortly before 9 p.m. Tuesday night HERE. Mayor Pro Tem Jim Righeimer expounded on this subject - he told us he was unanimously selected by the City Council a few weeks ago to negotiate with Solid Landings to resolve these lawsuits. He spoke about the difficulty Solid Landings had making their business model work unless they could locate several homes in residential areas near each other. The city ordinance that forbids such facilities within 650 feet of each other put a crimp in this plan. He also spoke about the "consumer protection" aspect of this situation - citing families selling their homes to cover the cost for children in rehabilitation homes to the tune of $25,000- $30,000 per month. WHAT ABOUT THE ORDINANCES NOW? Although nobody actually said it, one must presume that our two ordinances - one covering R-1 residential zones and the other covering all other residential zones in the city - will now be enforcable. Enforcement had been stalled by the lawsuits. 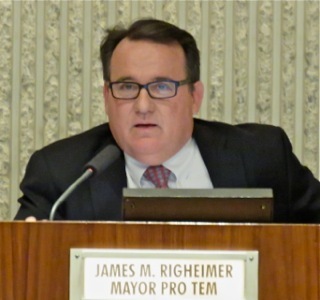 Kudos to the City legal team and to Righeimer for hammering out this deal. Council members Katrina Foley and Sandra Genis both were absent from the proceedings due to family issues. That turned out to be too bad, since several of the discussions would have benefited from their perspective. So, it was "boys night on the dais" - and they behaved like they were just hanging out at Skosh Monahan's pub with no adult supervision. 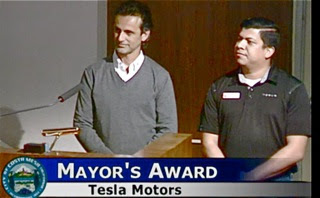 TESLA GETS MAYOR'S AWARD - YES, REALLY! 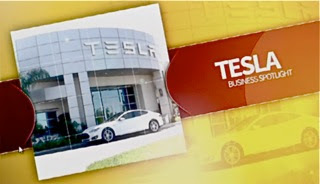 Mayor Steve Mensinger bestowed his Mayor's Award on automobile dealer Tesla, and managed to slip into his presentation a dig at city employees when, as he presented the key to the city, he said, "Don't let the unions get that key." Yeah, we know he was just kidding around - Steve being Steve and all that - but that kind of behavior only exacerbates the strained relationships between those guys and the employees. He obviously doesn't care. Presentations were also made to the leadership of Coastline Community College District with a proclamation naming April as Community College Month and April 21st as Coast Community College District Day in Costa Mesa. 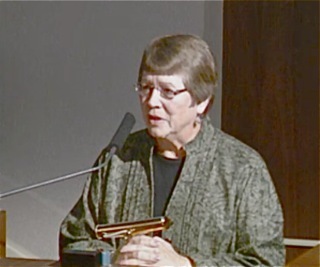 Former mayor Mary Hornbuckle - a member of the Coast Community College District Board, plus the presidents of both Golden West and Orange Coast Colleges attended. And, Mensinger issued a proclamation naming April as Donate Life Month. John Weiland, a liver transplant survivor, accepted the proclamation. 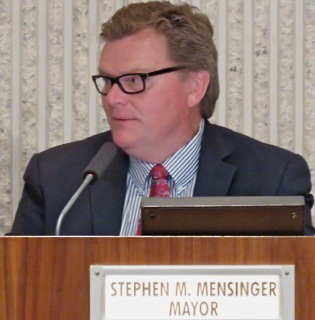 Mensinger announced that the Medical Marijuana issue was being removed from the agenda and will be heard at the next meeting, when Genis is expected to return. He also moved the final item of the night - the lighted fields feasibility study - forward to be heard first in deference to children in the audience. 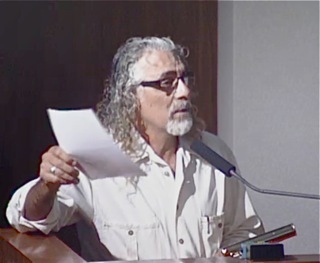 Eighteen (18) people stepped up during Public Comments to address a variety of issues. 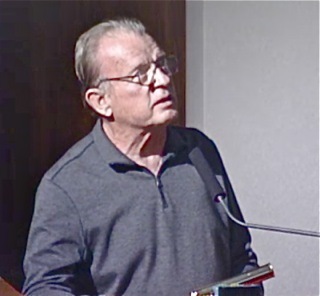 Donald Duman and neighbors addressed the delay in getting resident-only parking in their neighborhoods and were referred to Director of Public Services Ernesto Munoz. Dan Goldmann complained about the crowded conditions at TeWinkle Park and suggested the council budget more equipment for that venue. Flo Martin cited our water crisis and referred to trips her son makes to Zimbabwe, where the water crisis is critical. She suggested developments be required to utilize water capture measures. 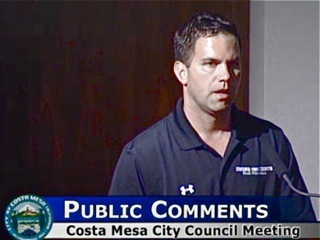 Eric Beach, a proponent of Flag Football organization "Under the lights" (sponsored by Underarmor) expressed a desire to be permitted into Costa Mesa. Tea Party Tom Pollitt presented illegible charts showing year-old employee compensation data to make some kind of incomprehensible point. He was followed by Gene Hutchins who launched into his one-note-samba - Unfunded Pension Liability. 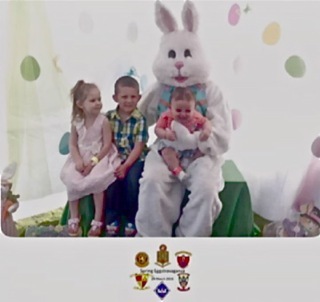 Beth Refakes gave a brief slide show of the recent Easter event for the children of the 1/5 Marines at Camp Pendleton. 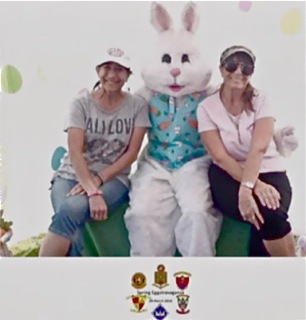 She thanked all who donated plastic eggs, candies and gifts and to her fellow-members of the Military Affairs Team who helped stuff the eggs and make the event a success. Westside businessman John Hawley wondered about certain elements of the Draft General Plan as it affects industrial areas of the Westside. Jerry Galif (sp?) stepped up to praise the council for all the wonderful things they've done and brought a bag of liquor bottles as a conversation aid as he complained about the homeless folks hanging out near a liquor store near his home. Chuck Perry also praised the council for all their good works and said, "I don't always agree with you guys but I believe in you guys." Old Chuck tested my gag reflex with that one. 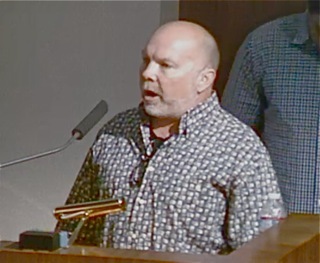 Jim Kerins, a member of the Bikeways and Walkability Committee, also rose to praise the council for their design guidelines and alley improvement. 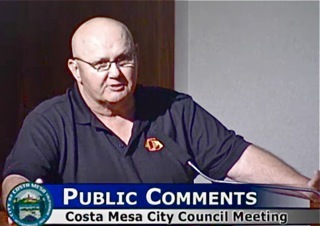 Turns out Jim would speak many times last night, all of the time gushing praise for the council. I guess he's in a business that is part of the development community... not a surprise. Mark (?) brought up the original plans for the completion of the 55 Freeway through "Downtown". That plan was abandoned long ago and Monahan told him about it. 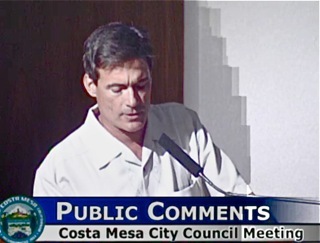 Mark also said the developers are using Costa Mesa as a prostitute. Clever turn of phrase. 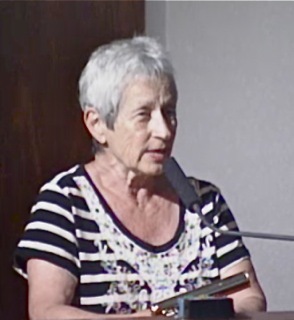 Tamar Goldmann accused members of the council of improving their neighborhoods (she meant Mensinger and Righeimer) and asked they take the same consideration to other neighborhoods in the city. She also refuted the fact that we were adequately paying our police because the real test would be the ability to attract quality lateral transfers - which we have not done. 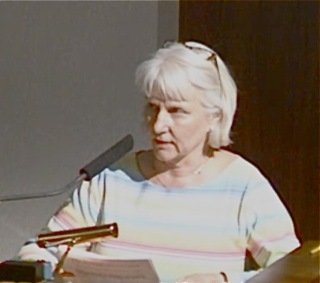 She also spoke of ground water capture, suggesting a necessary requirement for developers to use permeable pavers and similar devices to help recharge the aquifer. 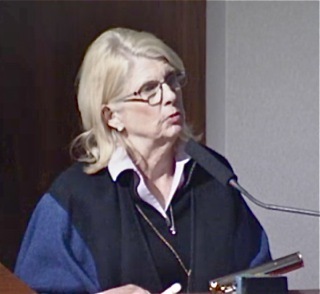 Cynthia McDonald compared the current General Plan and the draft of the update, finding that somehow 5,000 single family homes may have mysteriously disappeared. She finished at 7:00. 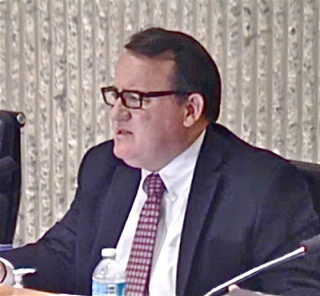 During Council Member Comments Mensinger talked about three calls he'd recently received about quick police responses, told us an anecdote about an acquaintance's son - a 3-year police officer in the City of Orange - who wanted to come to the CMPD because of all the good things he'd heard about it. He also praised Munoz for his dedication - even taking calls from council members on the weekends. Hey, Steve - quit bugging Ernesto during his rare time off, for goodness sake! He also told us his "Meet The Mayor" event scheduled for Sunday had been canceled due to a family event. Monahan apologized for his phone going off earlier - it was his wife in Big Sur. He also told us it was Autism Awareness Month - he has an autistic son - and asked us to wear blue and contribute to organizations dealing with autism if possible. Then it was Righeimer's turn - another long-winded rant covering a variety of issues. He blamed Genis for the condition of the alleys during her earlier tour on the council without actually naming her. He talked about "problem motels". He complained because in government it just takes longer to do things. Then began a string of memorable quotes. He said, "This council has a good relation with the employees." I found myself wondering which employees he was talking about, because his actions only show disdain for them. He spoke about the "Miscellaneous Employees" contract - it was a terrible deal for them! - and the pending police contract. Then he said, "We have a great relationship with the police. Now, yes the fire contract comes up now. Is there gonna be some tension? Are people gonna say stupid things? Are people gonna put things on Facebook? Yeah! Is that like divisiveness and toxicity in the community? No, it's called negotiation. It just kinda happens." And I found myself thinking to myself, right there he demonstrated what a two-faced person he is, and why he just cannot be trusted. He's living in some kind of alternative universe. 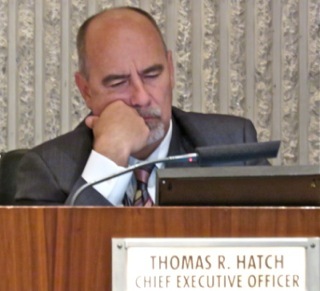 CEO Tom Hatch had no report, to which Mensinger and Monahan expressed glee. How very sad for Hatch. One item, #5, was pulled from the Consent Calendar by Robin Leffler and was heard at the very end of the meeting. The remainder of the Consent Calendar passed on a single vote, 3-0. At 7:20 we began hearing New Business #4, the feasibility study for lighted fields and use of artificial turf on three schools. Three members of the public, Brett Woods and Umi and Shawn Patterson, spoke in favor of it, citing the shortage of fields, particularly if Daylight Savings Time is stopped. It passed on a 3-0 vote at 7:30. Next up was the only Public Hearing on the agenda, the proposed updates of the SoBECA and Westside Urban Plans. Assistant Development Services Director Claire Flynn led this discussion. 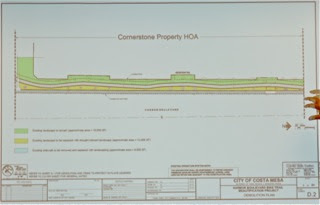 She walked us through the proposed changes using the charts in the staff report and, with the assistance of the architect the City contracted, showed some examples of different architectural styles that might be used on future projects. Four members of the public spoke on this issue. John Hawley wondered about new industrial developments and indicated the need for a park on the Westside. 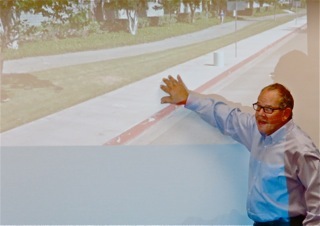 Robin Leffler echoed the need for a park and was concerned about the narrow setbacks and how they would complicate potential street widening in the future. She also expressed an opinion that, since some of the new developments used a modern style, those kind of units should not be forbidden. Wendy Leece observed about parking at one of the recently-completed projects - Sea House - near her Westside home. She observed the improvements in the north part of town - near where Mensinger and Righeimer live - and hoped for similar improvements on the Westside. She cited the impact on the quality of life for Westside residents. 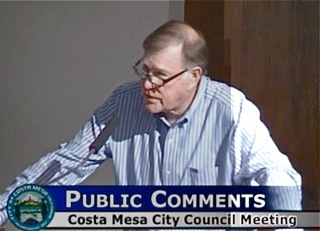 Jim Kerins again spoke, citing Costa Mesa as a breeding ground for talent, and told the council they were fantastic. Monohan spit back at Leece, calling her comments ridiculous. 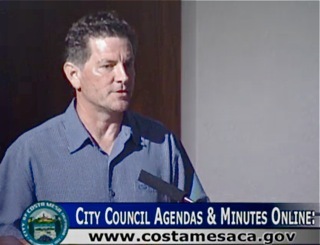 He said the arguments that we were adding traffic with new residential projects that replaced industrial uses was "bogus"
Mensinger, telling us he has walked 2,750 miles in the city, said that Sea House is not the reason for parking problems and chided Leece for living in a gated community. Righeimer cited the Lighthouse development with "ocean views". He spoke about the need for more commercial on the Westside, and mentioned a new business - a coffee roaster - who wanted to come to Costa Mesa. Then he said that "people buying those three or four story houses are not bringing kids", as a positive situation. The item passed on a 3-0 vote at 8:07. 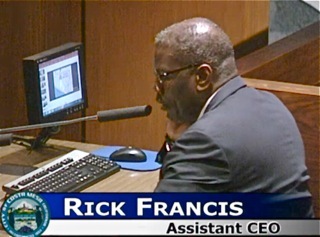 The discussion, guided by Assistant CEO Rick Francis, of the extension of the lease with the Boys and Girls Club was brief. Only Chuck Perry spoke to the subject, stating that we should not extend it for 48 years at $1 per year, but 10 years, max. In the end the council was satisfied that the financial and maintenance committments being made, and the bolstered terms of the lease, made it a satisfactory deal. Then came the discussion of what I refer to as the Smart Growth Initiative. The council only had to make three decisions. First, they could vote to accept it as-is and vote it into law. Or, they could officially vote to place it on the November 8, 2016 consolidated ballot. And, they could direct staff on an alternative ballot measure. Instead of simply voting to place it on the ballot right off the bat - they really had no choice because they were NOT going to vote it into law - they blew off the next hour with a discussion of the initiative! Before that, though, eight (8) people stepped up to address it. Only one - Kerins expressed the view that the council should offer an alternative. Susan Shaw expressed befuddlement on why the council would even consider an alternative - just let the people vote. Cynthia McDonald mentioned other cities with similar ordinances. 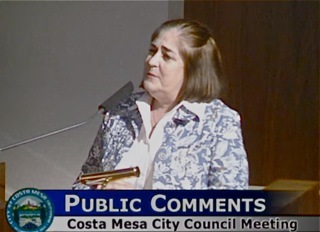 Tamar Goldmann told the council to not waste our money on another ballot issue. She also address the increase in traffic from new developments. Robin Leffler said she had hoped for a public presentation of the consultant's report - none had yet been forthcoming. She suggested we just do what the voters want - let them vote on it. Terry Koken suggested an alternative ballot measure could be referred to as the "second growth initiative" - and compared it to the return of cancer that had been in remission. He also muttered something he said was from the Kingston Trio. 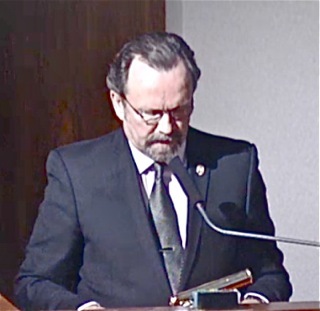 Jay Humphrey expressed a desire to show respect for the voters who had signed the petition. 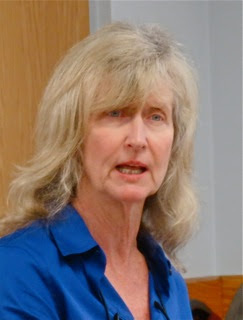 Wendy Leece expressed concern that the council would spend more money just to put a competing measure on the ballot to confuse the voters. All that took about fifteen minutes. Righeimer took over and he told us that folks gathering signatures had lied about the initiative, but provided no specifics. He pulled numbers out of context from the initiative to demonstrate the complexity and that people didn't understand it. Well, Jimbo, of course not! NOBODY would understand your mumbo-jumbo - which Monahan confirmed - as you tried to spread your own misinformation! 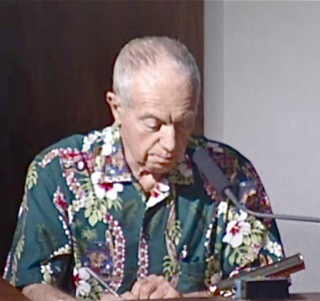 He raised questions about "retroactivity", and on and on. 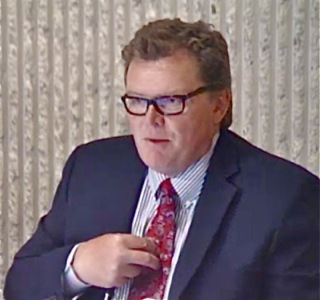 He asked Kathy Head, Managing Principle of the consulting firm Keyser Marston Associates, about differences between this initiative and Newport Beach's Greenlight initiative. And on and on it went with completely irrelevant issues. Their only task was to vote to place it on the ballot - all that jabbering was just political posturing and intentional attempts to confuse the public - and it won't be the last of it, either. Finally at 9:25, the council voted, 3-0, to place it on the ballot. 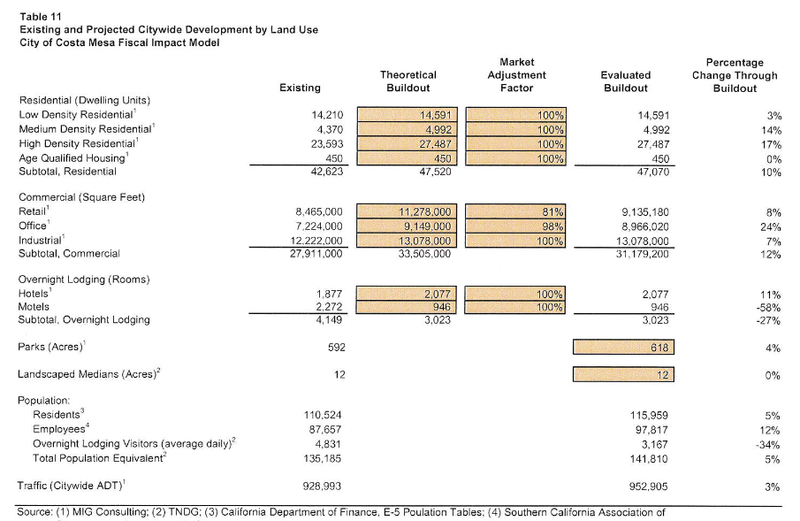 3 - Require planning for bike paths for commercial developments - mainly north of the 405 Freeway. 4 - He mentioned affordable housing, then spoke of the Bond measure, which was next on the agenda. 5 - He wanted "triggers" to be reasonable. Mensinger chimed in that he wanted it to insure NO residential development north of the 405 - Righeimer refined it to mean "north of thr 405 and west of Fairview". They voted on it, 3-0, at 9:30 and called for a break. 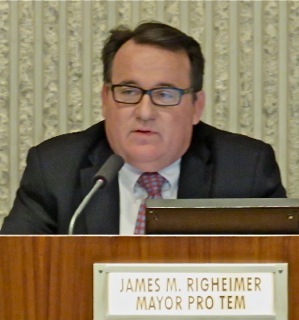 At 9:40 City Attorney Tom Duarte did a brief presentation of Righeimer's plan to shut the mouths of affordable housing activists by placing a $20 million Bond issue on the ballot. Five members of the public spoke to this issue. Tamar Goldmann said she wouldn't support it because there was NO PLAN for how the funds would be used. She gave her definition of "blight" - Land that developers want. She indicated Affordable Housing could be paid for by placing a requirement on future development. Elearnor Egan - a former member of the City legal department and also a former planning commissioner - also suggested the same solution. Jim Kerins said he didn't like the idea that his kids would have to pay for this and said that "there's affordable housing only a couple miles away in Santa Ana." Beth Refakes didn't like the fact that there was NO PLAN and told the council they needed to re-think this scheme. 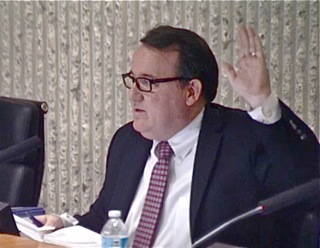 Robin Leffler observed that all three of the council members took the "no tax" pledge, yet they were willing to saddle the residents of this city with long-term debt. 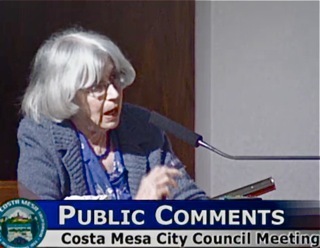 She mentioned the developer of 1901 Newport Boulevard who included affordable housing in his project, then went bankrupt and it as lost. She also suggested that developers pay for affordable housing and that we not spend the money to put this on the ballot. 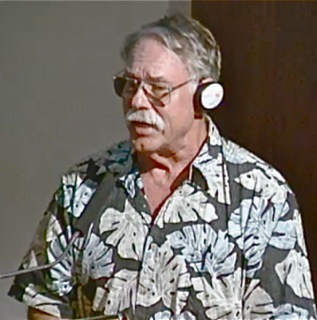 Mensinger chided Leffler, referring her suggestion as "code talk" and repeatedly criticized her by name. Referring to developers, he said, "People like Robin want to denigrate anybody that wants to do this and she's been doing this for 30 years." During that discussion he and Righeimer conspired to lie about Leffler, implying that she had sued the developer of 1901 Newport when exactly the opposite was true - he sued her! This is the kind of lies the voters are going to have to deal with as we move on into this election cycle. They lie and chuckle about it. I'M GREAT, SO DONT QUESTION ME! As Righeimer discussed this at one point he said, "I understand this stuff more than most people understand it - I just do!" He forgot to mention that he's also very humble. He criticized those who would have developers pay for affordable housing. He pulled numbers out of the air that varied by multiples of 100% before he settled on the unknowable "20 bucks a year" for the cost of affordable housing. This was another of his "speaking in tongues" moments, where he just makes it up as he goes along with no apparent regard for the truth. 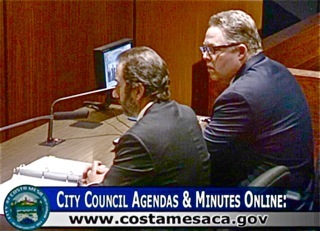 He said, "Put your money where your mouth is, Costa Mesa." 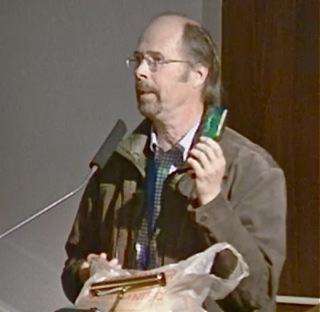 He went on to say, "If the citizens do not want it and they vote it down - it's going to take a 23 vote, folks - but at least 50% don't vote for it, don't every come back to these microphones again and say you want affordable housing. If you went out there at least fighting for it, pushing for it or campaigning for it, because you're full of hot air!" So much for Humphrey's call for giving the voters respect, huh? 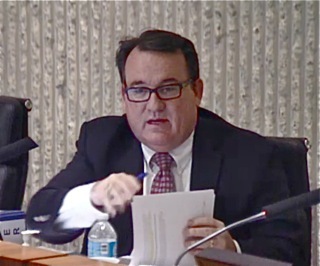 At 10:05 the council voted, 3-0, to have the staff and consultants craft the Bond language which would include all those pesky details - like how the money would be spent, for example. I can tell you, the sentiment I saw last night was to NOT hand Jim Righeimer $20 million for some amorphous scheme that might result in affordable housing. And, I don't think he thinks the voters will pass this measure, so he can then just spit in the eye of affordable housing advocates. WHERE WERE THE AFFORDABLE HOUSING ADVOCATES? 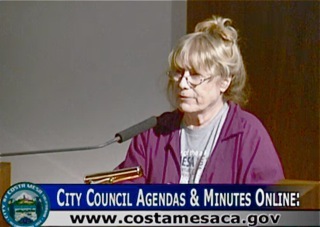 I thought it was interesting, by the way, that not one of the many members of the Costa Mesa Affordable Housing Coalition - the major advocacy group in the City - were present in the auditorium. That's hard to figure out, unless they saw through Righeimer's scheme and realized their thoughts would fall on hostile, deaf ears. 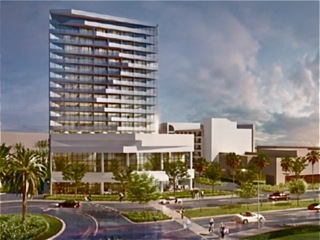 Next up was the latest version of a project at 3350 Avenue of the Arts, which modifies a previously-approved plan for a condominium development in a 23-story building into a 15-story building with 150 more units, all hotel rooms, which will generate large amounts of Transient Occupancy Tax revenue. The goal for it to be a 4-Star hotel. After a brief discussion the council voted to approve the plan on a 3-0 vote at 10:18. 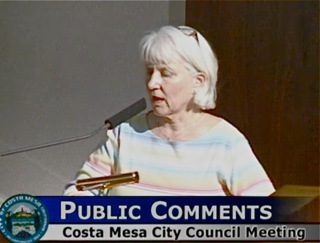 Robin Leffler spoke on Consent Calendar item #5, the Placentia Avenue at 20th Street illuminated crosswalk project, expressing concern for the slippery nature of the product. The council voted on it at 10:20 and adjourned the meeting. This meeting really needed the voices of Katrina Foley and Sandra Genis. While the discussions would have certainly been longer, they would have been much more balanced. Without their presence it was clear that the remaining council members - the boys club - knew they could operate with impunity, with nobody to challenge them. 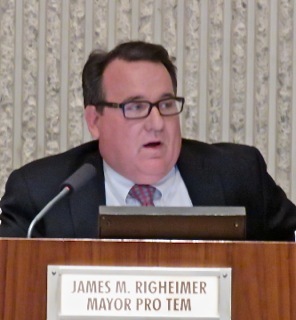 And, Jim Righeimer demonstrated again what a schemer he is, particularly with his "I'm going to show them!" Bond issue. The city deserves much, much better - but we're saddled with him for another two and a half years. Woe is us!